Legend has it that the Scottish North West Highlands UNESCO Global Geopark is where the Norse gods practised their mountain building skills before they created Norway. In this case, there is a thread of truth to the legend, because the Caledonian-Appalachian Orogeny is the common shared geological heritage of Norway, Scotland, Greenland and North America. In the North West Highlands UNESCO Global Geopark (see UNESCO Global Geoparks for more information on UNESCO Geoparks) you are surrounded by the Earth’s early history, stretching from the Archaean to the Devonian, with an abundance of ‘deep time’ geological heritage. The low population density, late retreating glaciers, deforestation and slow plant colonisation have produced a perfect storm for viewing features from a huge range of geological time periods. North West Highlands. Travelling north-west past Inverness through the Scottish Highlands you enter the southern end of the North West Highlands Geopark near the busy ferry port and fishing town of Ullapool. 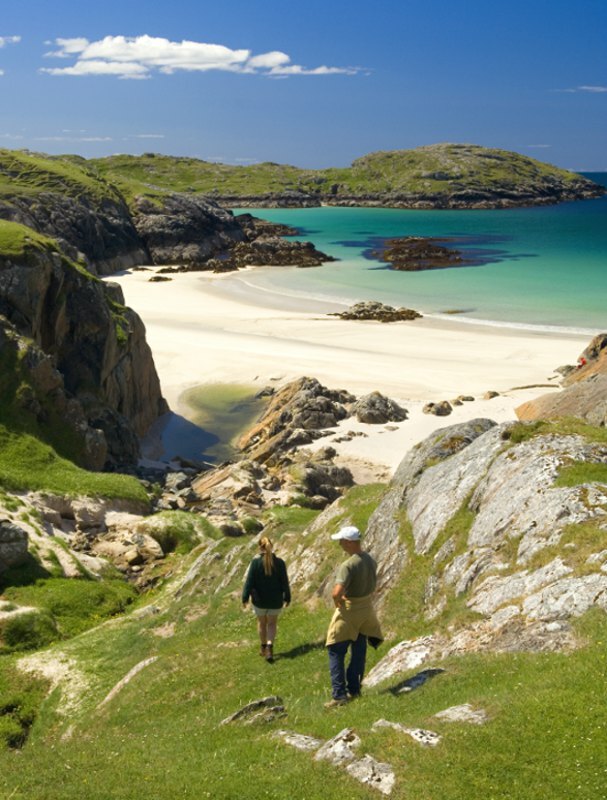 The Geopark encompasses mountains, peat-land, beach and forest, as well as the coastlines of Wester Ross and West Sutherland and on to Scotland’s north coast beyond the settlement of Durness and Loch Eriboll. Its eastern boundary follows the Moine Thrust Zone, the internationally significant geological structure that helped 19th-century geologists work out how the world’s great mountain ranges were formed. 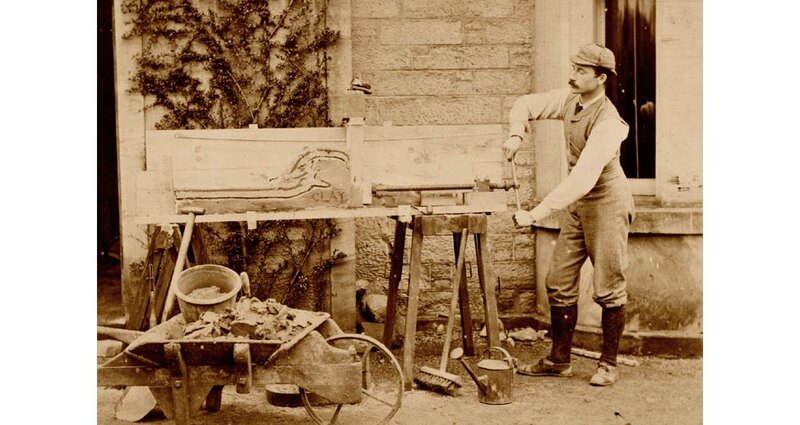 It cannot be a coincidence that Scotland was at the very forefront of pushing the boundaries of understanding during the Scottish Enlightenment of the late eighteenth century, just as the science of geology was established. The main route through the Geopark is known as the Rock Route, now part of the North Coast 500, a route internationally renowned as one of the best drives in the world and Scotland’s answer to Route 66. 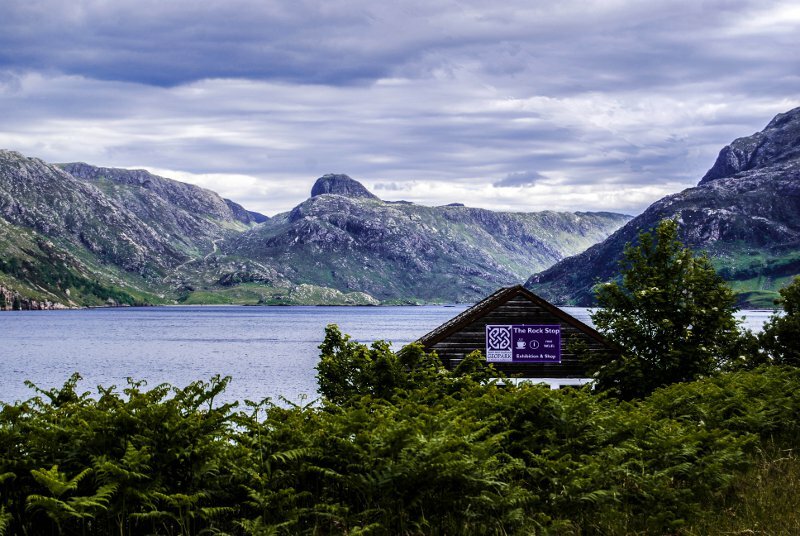 The 160 km Rock Route has 14 geo-stops along the way, and one not to miss is Knockan Crag National Nature Reserve, just 20 minutes’ drive north of Ullapool. Here you can see the Moine Thrust and touch the brittle fault between the Moine and the Cambro- Ordovician sedimentary rocks. The theory of this dramatic rock reversal was confirmed by Benjamin Peach and John Horne of the Geological Survey in 1907. There is family-friendly interpretation in the ‘Rock Room’ including touch screen computer systems, a Moine thrust machine and panoramic views of the mountains complete with narration to help you pronounce the Gaelic hill names. 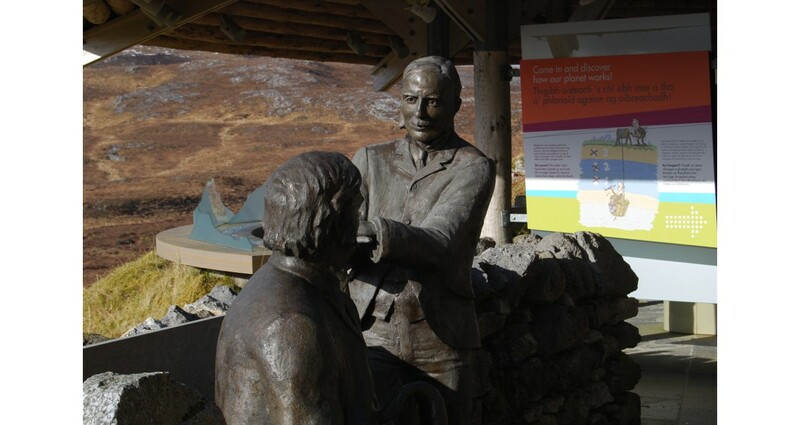 Benjamin Peach and John Horne play host to visitors at the Knockan Crag National Nature Reserve. The Rock Stop and the Stac of Glencoul. The unmanned open air visitor centre at Knockan Crag National Nature Reserve affords spectacular panoramic views over the Assynt landscape. For visitors with time to travel the full length of the Rock Route a leaflet provides a guide to all 14 localities, enabling visitors to interpret the landscape from the roadside. For those who want to dig a little deeper there are a series of Pebble Routes. These are shorter driving or cycling routes which guide you off the beaten track and into the story of the fascinating and interconnected geological heritage of the Northern Hemisphere as seen in the North West Highlands. 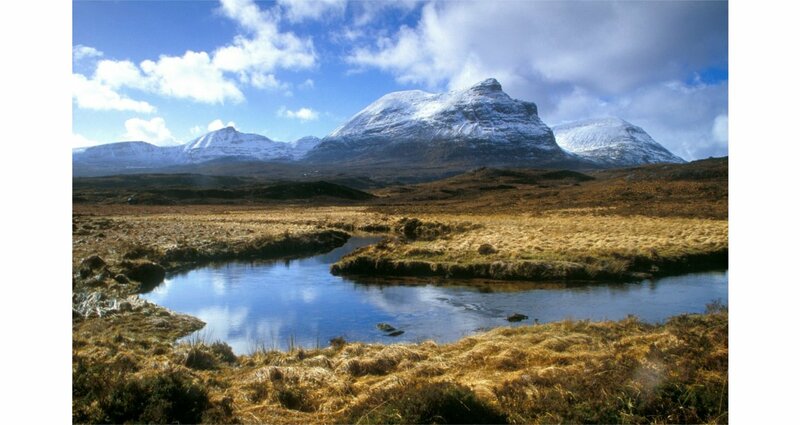 As you approach the halfway point of your journey north along the Rock Route you will descend past the peaks of Quinag to Loch Glencoul. Here you will find The Rock Stop, the UNESCO Geopark’s own interactive Earth Science exhibition. The Rock Stop overlooks the Stac of Glencoul, where you can view the Ben More and Moine Thrusts at the same time. 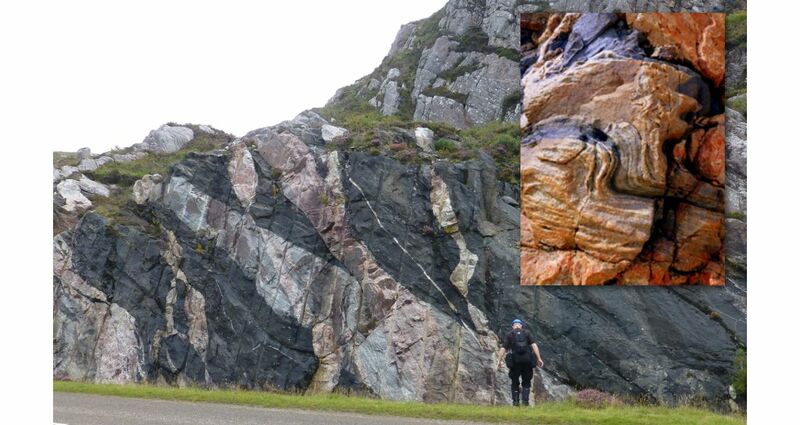 Glencoul has exceptional examples of thrust exposures and an unrivalled opportunity to view and understand the large-scale structure of thrust belts. Many families in the Highlands are crofters. Crofting is a small-scale farming operation which is usually augmented by other sources of income. It is not unusual for a crofting family to also run bed and breakfast or self-catering accommodation. This is the traditional way to stay in the Geopark. There are several boutique hotels offering a warm welcome and delicious locally sourced cuisine. Unique and quirky independent hostels are also available or you can book a pitch on a serviced camp-site in an idyllic spot. If you wish to truly experience the wild landscape here it is legal to ‘wild camp’, but you must familiarise yourself with the outdoor access code first. The closest major airport is Inverness, with flights directly from Amsterdam, London and Dublin. From Inverness you can drive to the Geopark in less than an hour and a half. Car hire is available at the airport and Inverness train station, and buses operate regularly inbetween Inverness and Ullapool, the Geopark’s gateway town. It is possible to catch a connecting bus on northwards, including the bike transfer bus. North of Loch Glencoul and the Rock Stop we enter a landscape of rocks with their roots in very deep time. The Lewisian Gneiss which surrounds you is the oldest in Western Europe, dating up to 3,000 million years old, and as far we know it goes all the way down to the bottom of the crust. It formed over a long period of time, roughly one third of the age of the Earth. It started as magma, which cooled and crystallised to form igneous rock. This was then buried very deep in the crust (over 25 km) and suffered very high pressures and temperatures during several mountain-building episodes. It formed a very hard rock, which is coarsely layered, with alternating light and dark bands. There are places where you can see the bands have been bent and folded under the high pressures, before being split vertically and magma pushed up through it to crystallise and form dark igneous rock in sheets, which are called dykes. Spectacular outcrops of Lewisian Gneiss with igneous intrusions at Rock Route stop 11, known locally as the Multi-coloured Rock Stop. (inset) Lewisian Gneiss at Oldshoremore Beach, north-west Sutherland. Stromatolites at Clachtoll – the earliest signs of life in Britain. A very long period of erosion followed the formation of the Lewisian Gneiss, during which huge quantities were removed, perhaps as much as 35km. 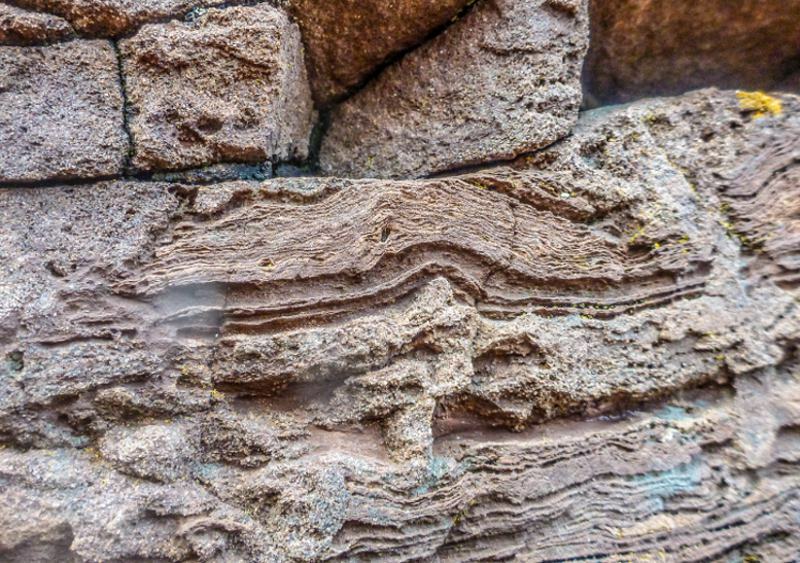 The lower parts of the Gneiss that we see at the surface now formed an irregular landscape upon which the Torridonian Sandstone was deposited from around 1,200 million years ago. The Torridonian is divided into several sub-divisions, with the most interesting of these being the one at the base, which is called the Stoer Group. It sits straight on the Lewisian Gneiss, but does not exist now over the whole Geopark area, as it was either not deposited everywhere or was eroded off before the rest of the Torridonian was deposited. It appears that it may have filled a rift valley which was formed as the continent started to break up and consists mostly of sandstone. 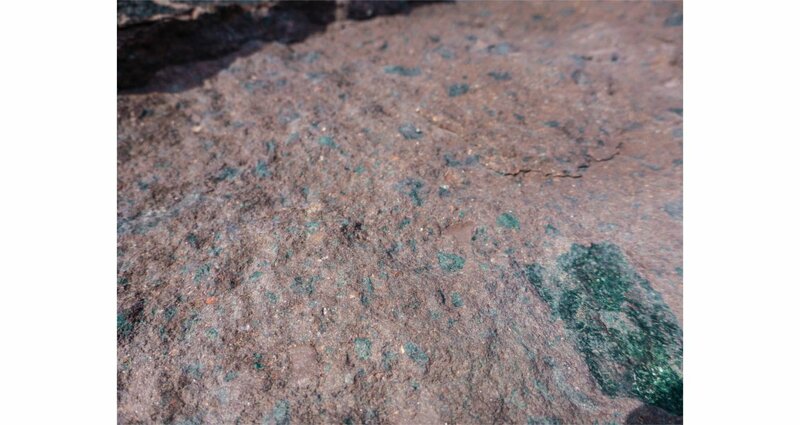 The scree slopes that draped off the hills of Lewisian Gneiss can still be seen in places and the oldest signs of life in Britain are here in the form of cyanobacteria. These bacteria either formed mats spread out on the surface of damp mud or humped up into mounds of bacteria and mud called stromatolites, which are really bacterial reefs. Ripples and mud cracks can sometimes be seen preserved in the mudstone and sandstone. Another fascinating layer of the Torridonian is called the Stac Fada. Originally thought to be a volcanic mudflow, emerging evidence is suggesting that it is material ejected from a meteorite impact. Research published at the end of 2015 strongly supported the asteroid impact theory. There is no doubt that extreme pressures and temperatures were generated and material flowed sideways with great force, with some being molten which cooled quickly whilst other material was blown high and rained down on the disrupted land surface in little balls that had accumulated as they fell. It has been proposed that the crater from the impact may be to the east near Lairg as there is a low in the gravity map there and some of the indicators in the flow itself suggest flow from the east, but a lot has happened in the intervening 1,200 Ma to be sure of this. UNESCO Global Geoparks are set up and managed by local communities and there are more than 100 worldwide. Every community is different and so every Geopark is different but they share a common aim which is to tell the story of the landscape and make it accessible to visitors. This helps to bring resources into sensitive rural areas, creating jobs and supporting small businesses. 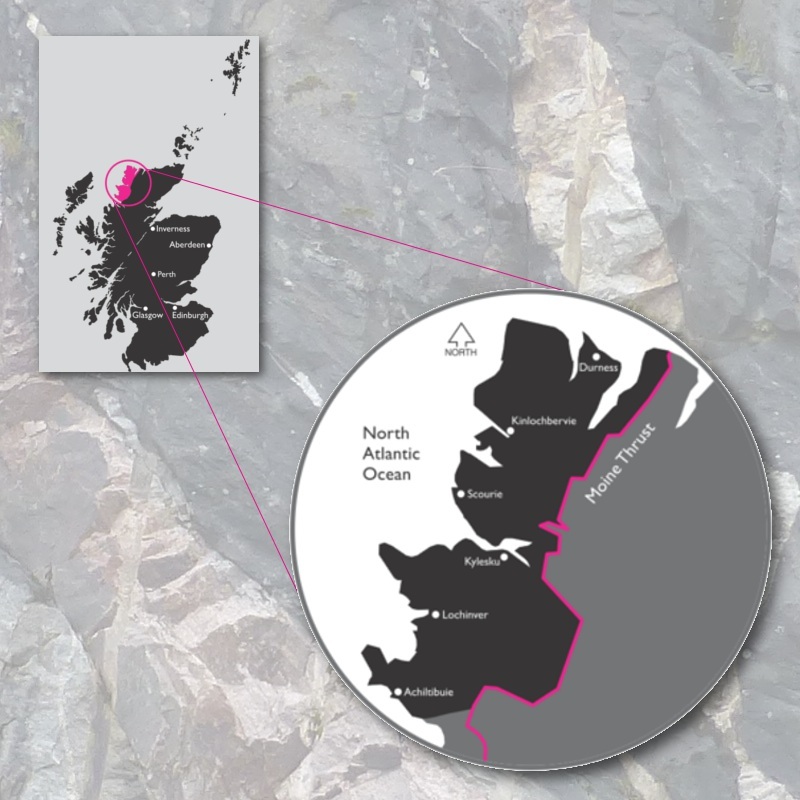 The North West Highlands Geopark was set up by the representatives from the community councils within its boundaries. It seeks to encourage adventures for everyone to help people connect with the land and feel responsible for maintaining its beauty, wildlife and resources. UNESCO Global Geoparks (UCG’s) are the geological equivalent of World Heritage Sites. Everywhere you see the UGG label you know there will be sites and landscapes of international geological significance which are continuously assessed by UNESCO to ensure they are meeting strict criteria for conservation, tourism quality, education and sustainable development. To keep up to date with developments at North West Highlands UNESCO Global Geopark find them online at www.nwhgeopark.com, they publish a regular newsletter and provide a wide range of information to help plan a visit to the North West Highlands. Smoo Cave near Durness. (Source: Iain Sarjeant courtesy Sutherland Partnership) The final leg of the Rock Route sees you descend a spectacular glaciated valley with the Cambrian Quartzite screes of Foinaven towering behind you. On reaching the Kyle of Durness you encounter a fertile grassy oasis in an area otherwise characterised by peatland. The fertility of the land here and resultant agriculture is due to the underlying limestone. 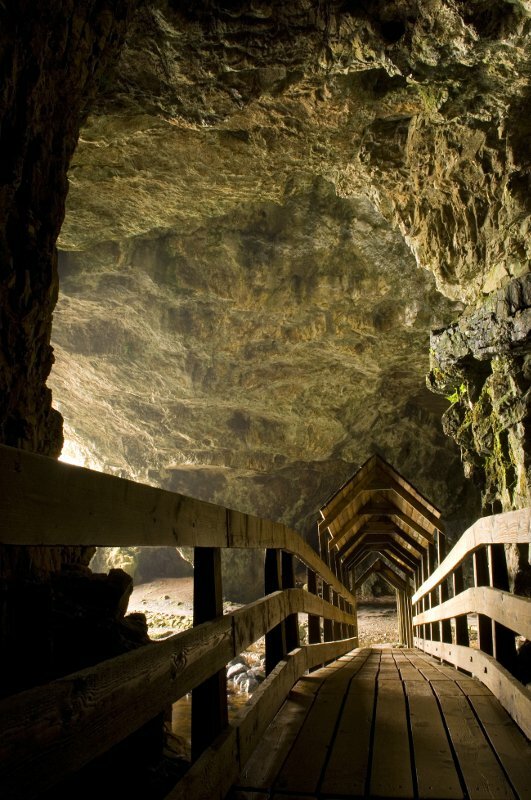 Here, just a few hundred metres from the sea, is one of Britain’s largest limestone cave systems. Smoo Cave, at the end of a long inlet from the sea, has been carved out through the interaction of coastal erosional and dissolution processes with a large karst drainage system. It is also an important archaeological site with evidence that Vikings hauled out their ships here for repair. Nowadays there is a family-friendly boat trip to explore the caverns before you continue east to Loch Eriboll, cross the Moine Thrust and the northern boundary of the North West Highlands Geopark. More ardent speleologists could join the Grampian team exploring the extensive underground network including a chamber as large as the Usher Hall in Edinburgh. 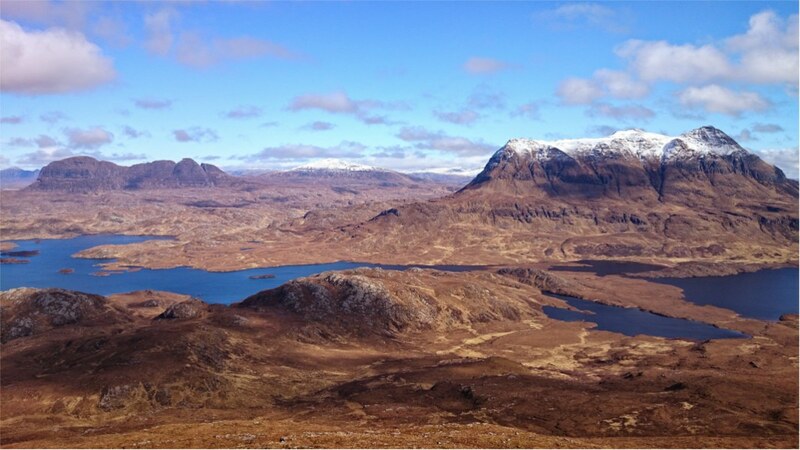 See www.nwhgeopark.com for more details on the North West Highlands Geopark.